What is Modified Accelerated Cost Recovery System MACRS? The US Congress acted in 1981 and 1986 to encourage investment in certain classes of depreciable assets, by allowing US taxpayers to use a form of depreciation known now as the Modified Accelerated Cost Recovery System (MACRS). The US Congress hoped in the 1980s to improve the economy by incenting firms to invest in assets. The Modified Accelerated Cost Recovery System (MACRS, US Only) is a form of accelerated depreciation enacted by the US Congress in 1981 and 1986. Congress introduced the depreciation system in 1981 as the Accelerated Cost Recovery System (ACRS). Congress intended to encourage investment in depreciable assets by allowing accelerated depreciation—and thus larger tax savings in the early years of depreciable life. Tax payers used ACRS schedules to depreciate assets placed in service between 1980 and 1987. Congress modified ACRS in the United States Tax Reform Act of 1986, naming the new system as the Modified Accelerated Cost Recovery System. US taxpayers currently apply MACRS depreciation to asset classes that include computing equipment, office furniture, automobiles, construction assets, and many others. Second, definition and use of MACRS depreciation schedules. 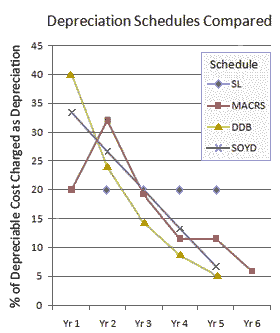 Third, MACRS depreciation compared to other standard depreciation schedules. What does the MACRS depreciation schedule accomplish? How does MACRS compare to SL, DDB, and SOYD schedules? Varieties of MACRS schedules: Which schedule for an asset class? The US Tax Reform Act of 1986: See Tax Reform Act of 1986. What Does MACRS Schedule Accomplish? The MACRS depreciation schedule is usually understood to refer to a special form of another well known accelerated depreciation schedule, the double declining balance DDB method. Accelerated depreciation schedules by definition allow owners to claim relatively more depreciation expense early in the depreciable life, and relatively less later in the depreciable life when compared to straight-line depreciation. Firstly, depreciation expense lowers owner tax liability by reducing reported earnings. Under accelerated depreciation, moreover, tax savings are greater early in depreciable life, but less in later in depreciable life. Secondly, depreciation expense lowers asset book value by turning part of the original asset purchase expenditure into an expense. This adjustment, in turn, enables owners to implement the accounting matching concept, under which they report expenses in the period they incur the expense. They incur depreciation expense, that is, as they use up (wear out or deplete) assets. When creating the ACRS Act in 1981, the United States Congress intended to incent businesses to invest in assets, improving the health of the national economy by improving productivity, creating jobs, and increasing trade. Firstly, MACRS and normal DDB methods start applying depreciation at different times. DDB schedules begin applying depreciation expense at the start of the asset's first year on the Balance Sheet. MACRS rules, by contrast, prescribe starting depreciation at the midpoint of the asset's first year on the Balance sheet. A five-year MACRS schedule thus contributes depreciation expense in 6 tax years, running from the midpoint of year 1 to the midpoint of year 6. The impact of starting depreciation in the middle of Year 1 is apparent in Exhibit 1, below, seen as the Year 2 "peak" in the schedule profile. Secondly, MACRS permits changing from the DDB method to straight-line depreciation, after optimizing depreciation benefits. This impact is also apparent in Exhibit 1, below, where the MACRS "curve" sits alongside the normal DDB curve. MACRS also follows normal DDB rules in one aspect. The MACRS schedule disreguards residual values (salvage values), as does the normal DDB schedule. Under MACRS and normal DDB, therefore, depreciation schedule percentages are applied against the full asset cost. In other words, under MACRS and DDB, depreciable cost= full asset cost. Modified Accelerated Cost Recovery System depreciation schedules and rules for applying them to different classes of assets appear in US Government Internal Revenue Service (IRS) Publication 946, "How to Depreciate Property." Information technology (IT) systems, for instance, are covered in the five-year depreciable life category, which also includes other kinds of office equipment and automobiles. Under MACRS, assets in these classes thus have 60-month depreciable lives. Exhibit 1. Four depreciation schedules compared across depreciable lives of 5-years: (1) straight-line SL (2) MACRS (3) Double Declining Balance DDB, (4) Sum of the Years Digits SOYD. Table 1. Depreciation expense each year of depreciable life, expressed as a percentage of either depreciable cost (SL and SOYD schedules) or full asset cost (MACRS and DDB schedules). Which Schedule for an Asset Class? The discussion above presented MACRS as a relatively simple adjustment to the familiar DDB schedule, where "Regular MACRS" calls for (1) starting depreciation at the midpoint of Year 1, and (2) depreciation changes from DDB to straight-line after optimizing the depreciation benefits. In reality, however, MACRS and US IRS Tax rules provide multiple possible schedules for different assets, depending on several factors including asset class, the purpose of acquisition, the timing of the acquisition, and source of funding for the acquisition. Regular MACRS, as described above. Double Declining Balance Method. This method is also called 200% DDB because calculation includes the doubling of figures. 150% Double Declining Balance Method. This form of DDB provides moderately "less acceleration" than the normal 200% DDB method, above. General Schedules (GDS), the most frequently used MACRS schedules. Alternative Depreciation Schedule (ADS) which may be used in some cases. In brief, the MACRS tax rules are complex. For complete guidance on which MACRS schedule applies to a specific asset, the best approach is to consult the 100+ page government source, US IRS publication 946 "How to Depreciate Property."